Having a fabulous look is not only for your wedding, but for the rest of your life. Therefore you need to pick a ring which would look great on you and could go with different outfits. This titanium ring with silver inlay would be a great choice, especially if you like the sparkling diamonds on top too. Rating: 4.6 / 5 , based on 8 reviews. Everything was as beautiful as we thought. I was very excited to get this ring - but always a little nervous when I order anything online. I was very satisfied and my fiance loved it as well. He wanted something different than a basic ring but timeless enough that he wouldn't regret having something trendy years from now. Very happy. I am very pleased with this ring. I would recomend this to anyone who is looking for a lightweight, durable, and must i mention BEAUTIFUL ring! 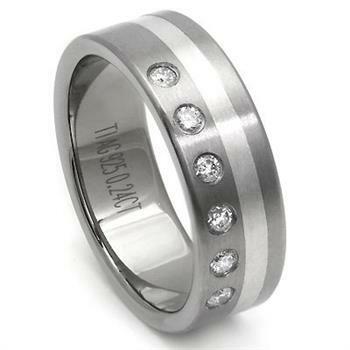 I ordered my husband the Titanium Silver Inlay Diamond Wedding Ring for our 24th wedding anniversary. I was expecting it to come in a few days later then it did ... it actually arrived perfectly on our anniversary. The ring fits perfectly and he loves wearing it! Thanks again for making our special occasion another "happily after". I ordered him a bracelet from you last Christmas and he loves wearing it and it looks very masculine and classy on his wrist. I would highly recommend Titanium Kay!!! I bought this ring for my fiance for our November wedding and i cant wait to give it to him. It is beautiful and arrived very fast. I have showed it to a couple of my friends and they were very impressed also. I would reccomend Titanium Kay the next time one of my friends needs a wedding ring for their husband!! This ring is very pretty but I had to send it back. My Fiance wears an 8 1/4 and I was told by Titanium Kay an 8 would fit. But this ring is an 8mm ring. Word of advise If its over 6mm get then next size up the 8 didnt fit so I returned it and ended up getting another ring off here which we both love. It was a size 8 6mm and fit perfect.